Pick Analysis: In 2014, started first five games before being suspended for four games for violating NCAA rules (accepted more than $3,000 to autograph memorabilia). In his first game back from suspension against Auburn, he tore his ACL. Rushed for 198 yards and three touchdowns on 15 carries against Clemson. In 2013, started 10 games, but missed three due to ankle injury. Tore through Clemson with 154 yards rushing and two touchdowns, including a 75-yarder on his first carry of the season. In 2012, selected second-team All-SEC, Freshman All-SEC and was the second freshman to rush for 1,000 yards in Georgia history (Herschel Walker in 1980). Set Georgia freshman record with 17 rushing touchdowns. Selected North Carolina Player of the Year in 2011 at Tarboro High School. Won three consecutive 2A State Championships. Gurley was hurdler for Team USA in Europe during spring and summer of 2011 and competed for the Bulldogs in 2013 indoor season. Finished the 60-meter hurdles with the seventh-fastest time in school history (8.12). Published: April 30, 2015 at 09:21 p.m. The St. Louis Rams pick University of Georgia running back Todd Gurley with the No. 10 overall pick in the 2015 NFL Draft. Published: May 1, 2015 at 03:03 p.m.
NFL Media's Michael Silver sits down with St. Louis Rams running back Todd Gurley to discuss the Rams tradition at running back, and what it meant to be the first running back taken in the 2015 NFL Draft. Published: April 7, 2015 at 09:15 p.m.
Take a look at the college highlights of University of Georgia running back Todd Gurley. 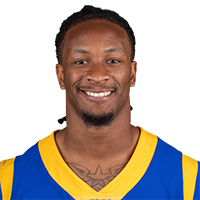 Published: April 30, 2015 at 09:25 p.m.
St. Louis Rams running back Todd Gurley shares his excitement about being the first running back taken in the 2015 NFL Draft. NFL Senior Fantasy Analyst Michael Fabiano breaks down the fantasy outlook of St. Louis Rams running back Todd Gurley. Published: Feb. 13, 2015 at 02:03 p.m.
Bucky Brooks takes a look at NFL prospect Todd Gurley and discusses which NFL player he compares best with. Published: Feb. 19, 2015 at 10:23 p.m.
Georgia running back Todd Gurley addresses the media at the 2015 NFL Scouting Combine.